Christmas Tag Tutorial for Gina K & Spectrum Noir! Hi Crafty Friends! I'm back today with a fun tutorial for Gina K Designs with my Spectrum Noir Markers. Today I'm using the adorable Winter Cheer Stamp TV Kit to make some fun Christmas tags. The first thing I did was download the Silhouette Cut Files document from the Stamp TV Freebies Page and used my Cameo to cut them out. Oh My WORD ~ doesn't get much easier! If you don't have a Silhouette Cameo, there is a PDF file available to cut them out with scissors. Next, I stamped all of the images. TIP: since the cardstock is white, it is easiest to use a dark background when stamping the images to the pre-cut shapes. I'll be using all of the images for a series of tags (more to come next week)... but today, I'm highlighting the cute little snowmen! I started with the BT2 Spectrum Noir Marker and added some shadowing to the edge of the snowman. TIP: If you don't have this marker, grab a piece of scrap paper and start scribbling with the markers you do have to find the color that works for you. Next, I used the CG1, CG2, and CG3 markers to color the scarf. I started with the CG3 and added shadows to the left edges of the scraf. Then added CG2, and then finishing with CG1. I like working from dark to light colors. Next, I added CR 8 to each edge of the hat. And then added CR7 in the middle of the hat. Then I went back in and added just a bit of CR8 to each edge. For the other cute snowman, I used CG3 & CG4 for the greens on the hat. I started with CG4 and then added the lighter CG3. Then I added the CR8 for the red. I finished the hat with CR7 and then added CR8 to the scarf and finished it with CR7 again. Here are the colors I used for my cute little snowmen. And once again, here are my completed tags. I finished them off with a snowflake image & sentiments from the Winter Cheer sets and pattern paper from the Stamp TV Kit. Check back next week for more tags using the images from this adorable kit. Hi Friends! I hope your Thanksgiving was fabulous and you're ready for some fun new products coming out later today from Crafter's Companion! 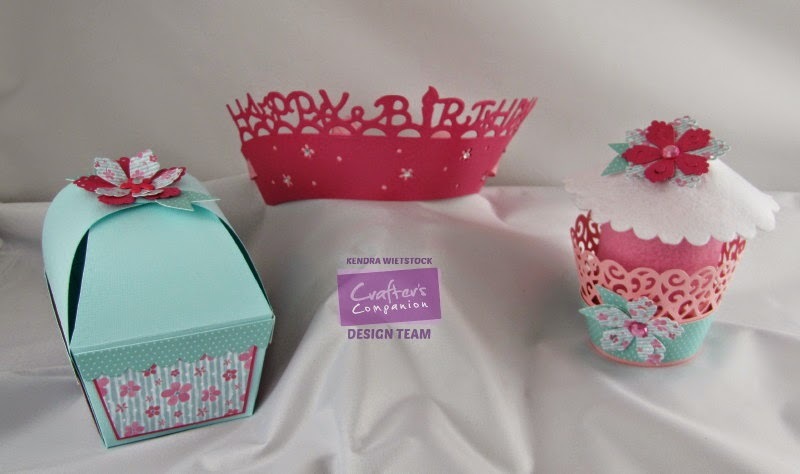 I'm sharing some projects I made with the brand new CUPCAKE WRAPPERS!!! How fun are these??? 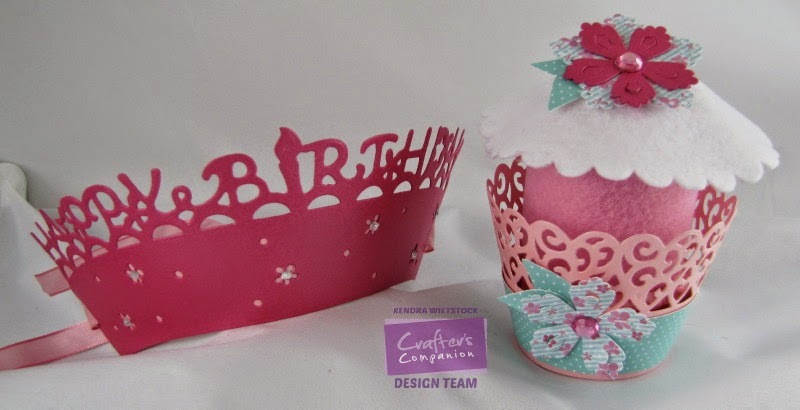 First up, I made a Birthday Crown with the Happy Birthday Cupcake Wrapper and the new Rose Pearl Shimmering Cardstock. I simply trimmed out the cupcake wrapper from the cardstock twice. in Rose Pearl Shimmering Cardstock. I trimmed off the Happy Birthday top from one, added some Pink Pearl cardstock behind the front layer and then attached the second layer to the back would look finished. I decorated the front with clear rhinesones and slipped ribbon through the tabs on the ends. So easy! Here is the back view. 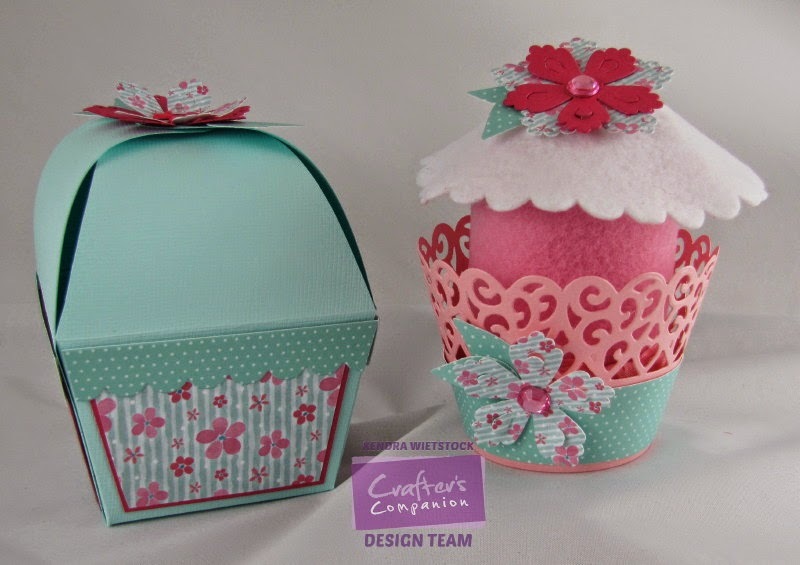 Next, I made a cupcake box using one of the new Cupcake Templates called the Single Cupcake Favour Box. I decorated it with digital papers I printed from the Sugar & Spice CD-ROM and the Die'Sire 3D Flowers Dies - Delicate Flower, Lace Bloom & the leaves from the Forget-Me-Not flower. For the coordinating cupcake, I used the new Lace Hearts Cupcake Wrapper. I made a little felt cupcake to fill my cupcake wrapper ~ basically because I was too lazy to bake anything... LOL! Seriously, these cupcake wrappers couldn't be any easier to make. Just cut them with your die cutting machine and slip the tab in the slot! I used wax paper between my paper and die so it was easier to remove the detailed cuts. I also added pattern paper flowers to decorate mine. Check out the Crafter's Companion Facebook Page over the next several days for more fun projects from out team. Hi Crafty Friends! Today I have a new Christmas card using loads of fabulous goodies from Taylored Expressions. For my card today, I used the Christmas Treat Toppers dies as my focal point. I just love that set of dies. They are perfect for cards, tags, layouts or treat toppers. 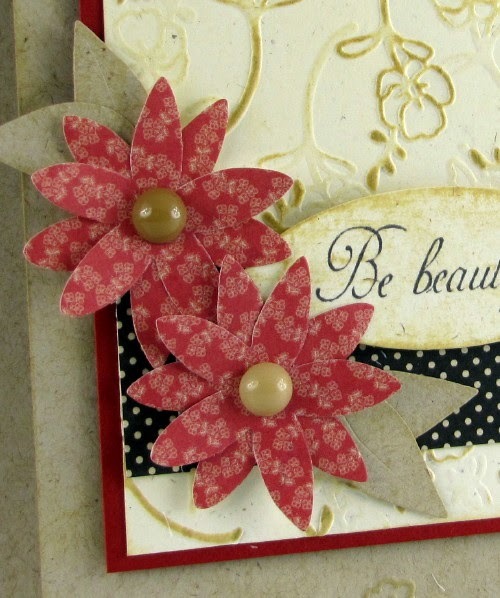 The great polka-dot texture on the background is from the Lots of Dots TE Embossing Folder. My assignment today was to pick a card on the Taylored Expressions Pinterest boards as inspiration, so my Pinterest Inspiration is this pretty card by Courtney Kelley. If you'd like to kick start your creativity, there is TONS of inspiration on the Taylored Expressions Pinterest boards. Check it out!! Today I'm sharing a card using loads of the new products that are being released this week! I also have a quick and easy tutorial using these pretty new Sugar & Spice Embossalicious Folders ~ Daisy Chain & Elegant Orchid. Step 1: Cut card base from Kraft Cardstock (4 1/4" x 11"). Step 2: Using the Daisy Chain 6x6 Embossing Folder, line up the folder to the edge of the card and run the card through the cutting/embossing machine. Here is how it looks after the embossing. Step 3: Using Distress Ink (Antique Linen), apply ink directly to the embossed card panel from the ink pad in a circular motion. Hold the ink pad in your hand and have your card panel on a flat surface for best results. This will bring the embossed image to life. Step 4: Trim a piece of lighter cardstock 3 1/4" x 4" and emboss the card panel using the 8x8 Elegant Orchid Embossing Folder. Step 5: Reposition the same card panel and emboss it again with the same embossing folder. Step 6: Using Distress Ink (Antique Linen), again apply ink directly to the embossed card panel from the ink pad in a circular motion. Step 7: Using the new Die'sire 3D Flower Dies ~ Forget-Me-Not, trim four flowers from pattern paper & layer them. Also trim four leaves and ink with Antique Linen Distress Ink. 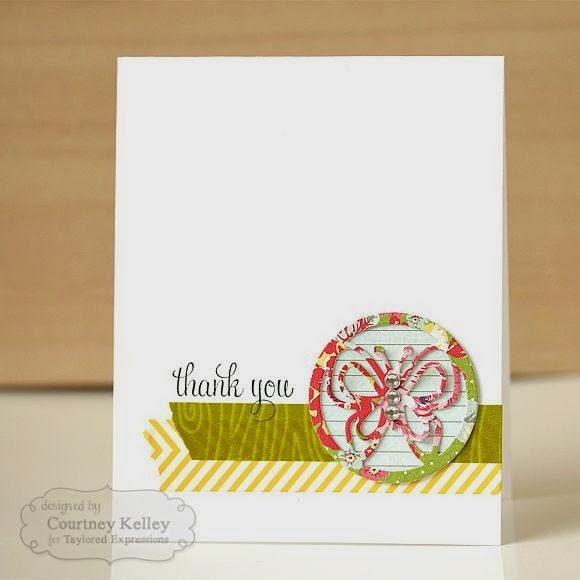 Step 8: Stamp a sentiment, trim with Cameo Stamping Frame die & assemble the card. It's as simple as that ~ Easy Peasy!!! Hello & Happy Monday! I know Thanksgiving and Christmas are just around the corner; however, I have this adorable little spring-looking project to share today because there are some super fun projects coming out this week for Crafter's Companion. Check them out starting tomorrow! This cute Picket Fence Cupcake Wrapper is one of the products coming out, along with the Flower Topper/Insert Die set and the pretty little white flowers are called Forget-Me-Not Dies from the 3D Flower Die Collection. All of these new dies will be coming out this week! The box holding the cute little cupcake wrapper, is made from Shimmering Cardstock in Yellow Pearl, White Pearl and Green Envy. There are some beautiful new colors that you'll just love! I used my Ultimate Crafter's Companion Tool to score and cut the box ~ easy peasy! See you back here tomorrow with details on the first Crafter's Companion release this week! Next week is going to be a big week of fun Crafter's Companion releases and today I have a little sneak peek of a few products that will be coming out. The first product I'm peeking today is the Embossalicious Embossing Folder called Flutterby Butterfly. It is an 8"x 8" folder and is filled with a variety of gorgeous butterflies. The other items on my card is the die cut butterfly. It is part of the Butterfly Insert/Topper die set designed to go with some fun new cupcake wrappers ~ wait until you see those!!! For the background on my card, I used a sponge applicator and applied 3 colors of Radiant Neon ink ~ Electric Coral, Electric Orange & Electric Yellow. After they were blended, I put the cardstock in the embossing folder and ran it through my eBosser. Then I took a sanding block and lightly sanded the raised edges so some of the white would come through. The sentiment is from the Vintage Floral Sentimentals stamp set. Stay tuned next week for lots of fun projects and products! Ho, Ho, Ho... and here we go with a cute little Christmas card using some awesome products from Taylored Expressions. Today I am highlighting the Pockets & Pages 3x4 Photo Frame ~ it's one of my favorites! Along with the frame, I used this cute little reindeer from the Woodland Winter stamp & die sets. The 'Ho Ho Ho' sentiment is from the new Punchables Christmas ~ a super easy way to add a little bit of flair to your project. I'm a girl that loves creating and sharing my work. Enjoy your visit to my little corner of the web. Gina K Monday Morning Inspiration! All content, including text, photographs and concept design elements are © Kendra Wietstock. Content within this blog is shared for personal/non-commercial use and inspiration only. Thank you!